Hilary attended the 2018 Governors Awards at the Ray Dolby Ballroom at Hollywood & Highland Center in Hollywood last night. She was joined at the red carpet by her husband Philip Schneider. Hilary knocked our socks off in a hot-off-the-catwalk Armani Privé gown! Hailing from the brand’s fall 2018 couture collection, this impressive design incorporates a strapless neckline and column silhouette that makes an empowering statement. The actress let her dress do the talking by keeping her accessories to a minimum, opting for a black clutch and delicate earrings. At today’s Contenders LA, here’s what they said about What They Had, Bleecker Street’s family drama from first time writer/director Elizabeth Chomko. 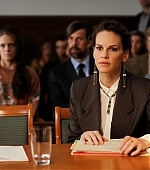 Chomko said she wrote the first draft seven years ago, and joked that was followed with 40 rewrites before the story became a film starring Swank as Bridget, who returns home to Chicago at the urging of her brother (Michael Shannon) to engage in an emotional battle with her father (Forster) over who is best to make decisions for her ailing mother, portrayed by Blythe Danner. She added that the story deals with the universal reality that the world does not stop when a loved one gets a difficult diagnosis. Of course, not everyone gets the opportunity to watch a version of one’s family portrayed by such a distinguished cast. “What can I say? I’m speechless, and honored,” Chomko said. Swank said that even though Chomko also served as the writer, as well as the director, she let the actors make the dialogue and the characters their own. Swank said the role of Bridget was perhaps her most vulnerable because it came the closest to herself. “I’m not boxing, I’m not dressing as a boy,” Swank said. “I’m playing a real woman who is trying to figure it out. That’s very vulnerable. 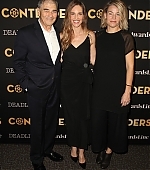 Hilary attened the 2018 LA Film Festival Unscripted with Hilary Swank at Wallis Annenberg Center for the Performing Arts on September 22 in Beverly Hills. Hilary Swank attended the ‘What They Had’ premiere during 2018 Toronto International Film Festival at Roy Thomson Hall on September 12 in Toronto.